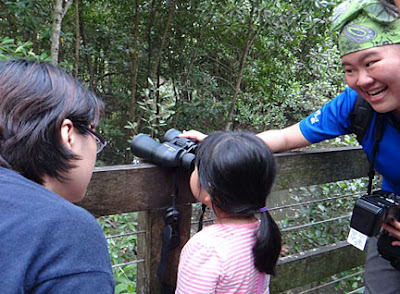 Last weekend, Singapore's nature community was buzzing with activities to celebrate Earth Day. This year Earth Day falls on the 22nd April 2013, which is a Monday. The Naked Hermit Crabs did not forget about celebration Earth Day too. We held a free public guided walk at Pasir Ris Park mangrove boardwalk for 15 visitors. We saw many interesting things we usually did not get to spot thanks to other kind park users. 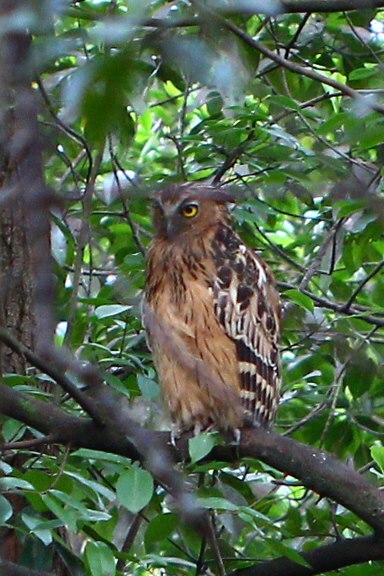 A very special find for both the guides and the visitor was the Buffy fish owl. It was the first time seeing the owl for many of us, including me. Thanks to Ivan's friend, Ho Yong Tze, for showing it to us. What a great way to allow the only children visitor enjoy this beautiful bird by sharing my binoculars and position it at the correct angle on the boardwalk to allow her to see too. It was so delighting listening to the child describing the colour and pattern of the owl to me. 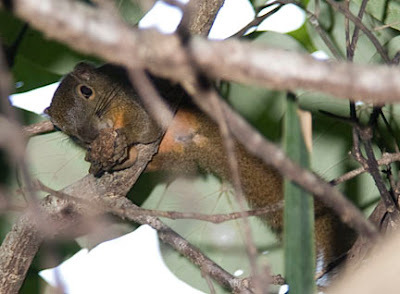 At the start of the walk, we had a pair of Plantain squirrels welcoming us to the boardwalk. It looks like they found some food to nibble. Wow! How lucky I was. The cicadas were calling out very close to me. If you only use your ears, you will be able to spot them easily. This cicada was seen during my pre-walk checkout trip and it was at eye level, though at an awkward position on the boardwalk. I managed to get a few decent side profile shot of it before I lost it. 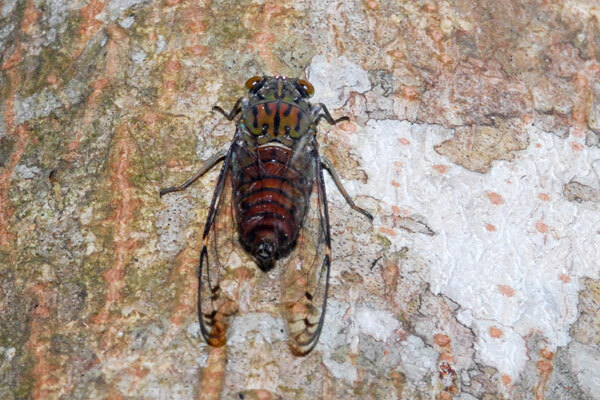 During the walk, one of the visitors 'helped' to locate this cicada and it is now resting higher up on the tree but facing us. 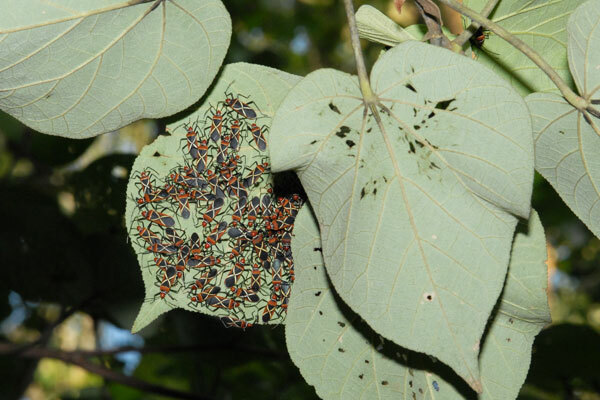 Sean found a large gathering of Cotton stainer bugs on one of the Sea hibiscus tree. 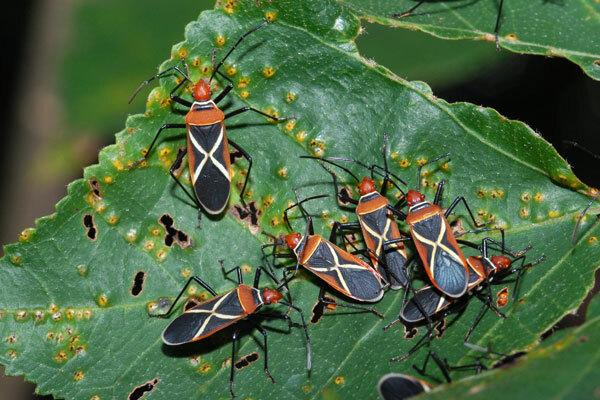 One of the groups of cotton stainer bugs can be seen easily at eye level. 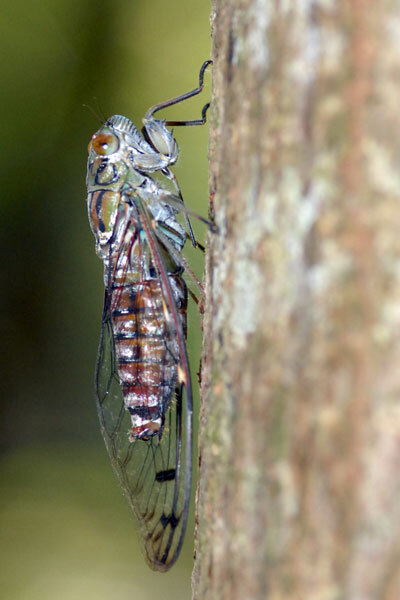 The adult bug has a white cross on its back while the nymph looks like a red dot. I did not see any nymphs around. One of our sharp eyed visitors spotted a few of these large snails feeding on the drier grounds in the mangrove. 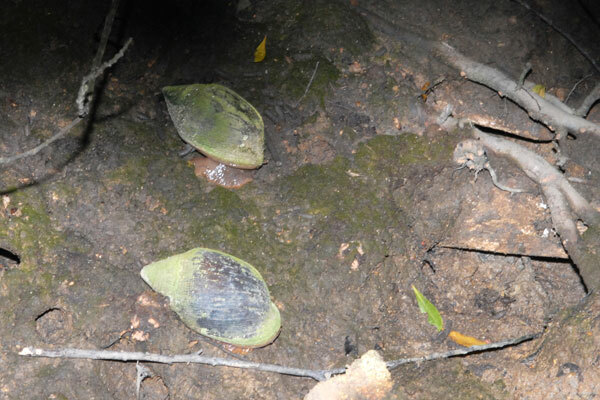 These are the Belongkeng snails and they are probably grazing on the algae on the ground. In the photo, you can actually see the snail. Many people would usually pass these badly covered shells as empty shells but on a more careful look, the shell might contain a snail. 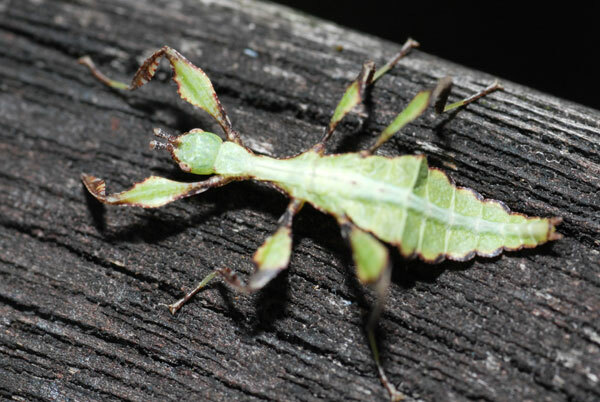 Some of our visitors were treated to this special visitor, a very small leaf insect on the boardwalk. It probably fell off from a nearby tree. On the return journey, the guided saw it again and Sean took some photos of it. Opps! It looks like I intruded the privacy of this two crabs. It was the only children in the group who mentioned to me she spotted a crab that took my attention. 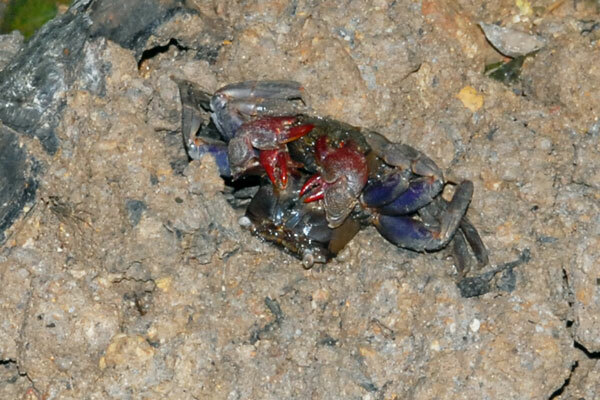 From the boardwalk, the crab looks unusual and different. My big camera with macro lens caught sight what this unusual crab position looked like. Oh, a pretty inch worm on the boardwalk. It reminded me about the inchworm song by Tony Bennet but on youtube, but I only found the version sung by Charles Aznavour the Muppet show. 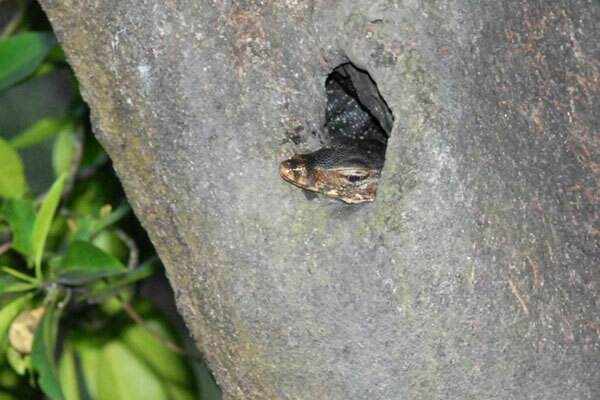 At the end of the walk, we stopped at a tree be intrigued by this young Malayan water monitor lizard staying in a cavity of the tree truck. This is not my first time seeing such behaviour. We wonder how it gets in and out. The lizard does not seemed disturbed by our presence. On the pre-walk trip, I was walking through the boardwalk looking for the Atlas moth caterpillar we saw during our March trip. 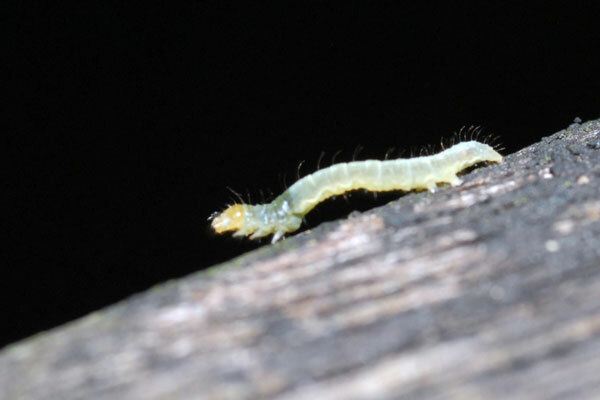 However I could not find the caterpillar. 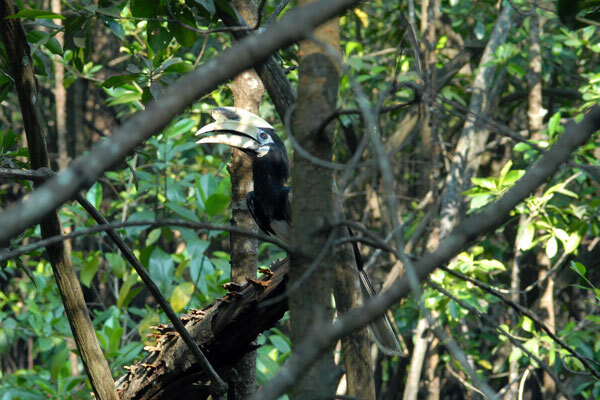 Instead, an Oriental piped-hornbill flew by and stopped on a branch 3m away from me. Wow! I was so happy to be able to see the bird that close. Of course, I was happily snapping away with my big camera. Where the bird landed in front of me. It hopped around for a while and flew off to another tree next to the boardwalk further down. 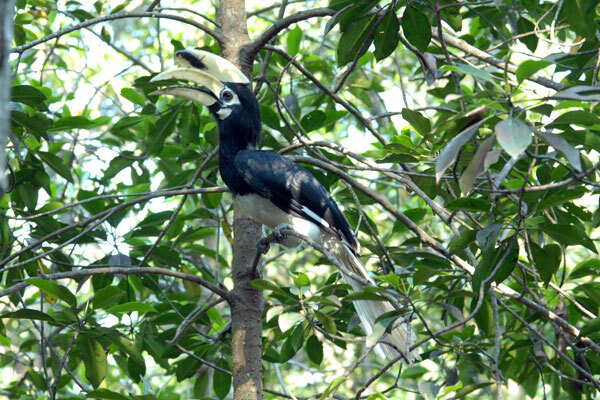 Ivan mentioned at there is a pair of hornbill residing in Pasir Ris Park. Could this be the one of them hunting for food? It was a great Earth Day celebration. I'm the little girl's mummy. We enjoyed the trip. Very educational for the girl. Thanks to Naked Hermit Crab. And, the map on the shore of Singapore is really a very good compilation!